Melior Via: Crowdfunding Successful, Thank You! Today, the Kickstarter project to fund The Thin Blue Line: A Detroit Police Story successfully concluded. Much to our surprise, we even managed to attain our $10,000 stretch goal. Thank you to everyone who supported the project and to all who helped us spread the word about it. We're indebted to you for your efforts. We intend to deliver a great product to you in return. Funding the campaign was a critical step in the process of making this game, but it is far from the final one. We still have quite a bit of work ahead of us, and I'd like to lay that time frame out for you. I'm going to break this down into the different elements. Please be aware that this is our plan. Plans can always go awry, but we'll do our very best to stay on track. With the campaign concluded, Kickstarter's going to start processing credit card transactions. There are always some issues in the process. So, it typically takes a week or so for the processing to complete. Then, there's another week or two before the money actually transfers to the company account. Unfortunately, we're a little restricted with what we can do until that happens. Essentially, we can't start spending large amounts of money or passing out rewards until we've confirmed that the transactions worked. For good or for ill, the campaign all so concludes just over a week before Gen Con starts. John will be at Gen Con next week, and he does have to take care of a few last minute preparations. Jason also has a short trip planned at the end of the month. Note, though, these trips were already budgeted into our schedule. John won't be incommunicado, though he may be a bit slower to respond. We're also going to commission Mikael Brodu to create a character sheet, after we have all of the revisions to the Player's Guide decided upon. We wanted to wait just in case it became clear that we needed to add or modify any setting specific game mechanics before we created the sheet. The PDF character sheet will, of course, be freely distributed once it's complete. We will have a form-fillable version. As artwork and backer feedback arrives, we'll get Chapters 6 and 7 through layout, aiming to have the PDFs available for distribution before the end of September. At that same time, we'll also order proofs of the print copies. Those usually take about two weeks to arrive. When we have them in hand, we'll quickly review them. 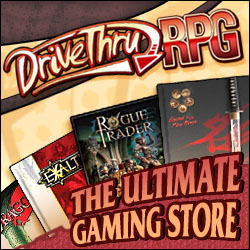 If everything looks like we expect, we'll turn on Print on Demand ordering at DriveThruRPG. At that time, we'll send out the coupons for the print edition to applicable backers. We'll also then order our prints for high end backers. These typically take two to three weeks to arrive. When they come in, Jason and I will get together to have a "signing and shipping party" for those. We already have the patches. A single prototype cost the same as ordering 50 of them. Based on the backer numbers, we have enough from that batch to cover our orders. I'll place the dice order with Chessex this week. They already have the files they used to create the prototypes, so hopefully this will go smoothly. I expect we'll receive the dice in late August, based upon the fact that Gen Con comes in between. I'll also place the map order with DriveThruRPG this week. Again, they have the files we used for the prototypes. I expect that shipment will come in within the next week. For backers at the $60+ level, we'll ship the Accessories out once we have all three in hand. We'll include any add-on accessories in that shipment. I'm going to wait to turn on Print on Demand ordering of the map until after we're ready to send this shipment. It doesn't feel like it would be fair to our $60+ backers if the PoD version was available before we could ship these out. When I turn that on, though, I'll send out coupons to everyone that added this on.